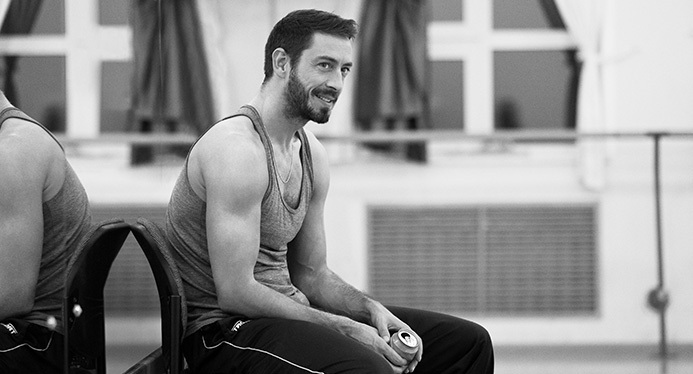 … born 1977 in London, England, is a British choreographer. A former principal dancer with the Stuttgart Ballet, his ballets have been premiered by Stuttgart Ballet, Norwegian National Ballet, New York City Ballet, Netherlands Dance Theatre, and several other European ballet companies. Born in England Douglas Lee started his ballet training at the Arts Educational Schools London and then received a scholarship for the Royal Ballet School, where he graduated in 1996, winning the Alicia Markova Award. Douglas Lee then joined The Stuttgart Ballet; his promotion to Principal Dancer followed in 2002. As a principal dancer, Lee danced many roles for choreographers such as John Cranko, Jiri Kylian, John Neumeier, Hans Van Manen, Glen Tetley, George Balanchine and William Forsythe. Douglas made his choreographic debut in February 1999 for the Stuttgart-based Noverre Society's 'Young Choreographers', upon which he was commissioned to create a new work for the Stuttgart Ballet. He also participated twice at the New York Choreographic Institute to work with dancers of The New York City Ballet. With Aubade and Lachrymal, Lee presented his first works for the Stuttgart Opera House; new creations for the Stuttgart Ballet also included Viewing Room, Dummy Run and Leviathan. His tenth work for the Stuttgart Ballet, Nightlight, premiered in March 2010. Following his choreographic success in Stuttgart, he became a freelance choreographer working internationally. His creation Fanfare LX for the Stuttgart Ballet was taken into the repertoire of the Staatsballett Berlin. He created Fractured Wake and returned to create 5 for Silver for the Norwegian National Ballet, Rubicon Play for the Royal Ballet of Flanders and Lifecasting set to the music of Steve Reich for the New York City Ballet, which was shortlisted in Time Out NY as one of the outstanding dance works of 2009 and taken into the Stuttgart Ballet repertoire. He then created Miniatures and Aria for the Stuttgart Ballet, Souvenir for Perm Opera Ballet Theatre which received 3 Golden Mask Award Nominations, Septet for Tulsa Ballet, Iris and A-Life for Ballet Zurich, Chimera for Ballet Augsburg, Legion for Netherlands Dance Theatre 2, PianoPiece for Theater Dortmund, The Fade for Ballet Mainz, Doll Songs for Ballet Nuremberg, Ophelia for Ballet de l'Opéra national du Rhin and Playground for Atlanta Ballet. His creation Snow Was Falling for Perm Opera Ballet Theatre received the Golden Mask Award for best choreographer 2016.